Emelie Schepp awarded The CrimeTime Reader’s Choice Award: Crime Author of The Year – for the third time in a row! The CrimeTime Specsavers Award was founded in 2015 by the CrimeTime Festival and the main sponsor Specsavers Sweden. For The Reader’s Choice Award: Crime Author of The Year the readers are the jury and vote for their favorite author. 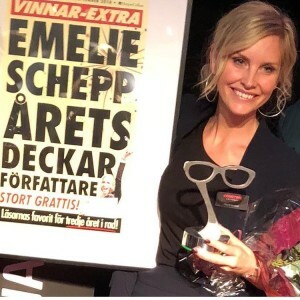 On Saturday at the Gothenburg Book Fair during the CrimeTime Fesitval, Emelie Schepp was once again awarded the prestigious prize! “Being praised by the readers this way is so amazing. I am incredibly grateful to everyone who voted for me again this year!” says Emelie Schepp. The winners of the CrimeTime Specsavers Awards 2018 was presented during a ceremony at this year’s book fair in Gothenburg. Previously, the CrimeTime Festival took place in Visby, Gotland, but as of this year the festival is part of the Gothenburg Book Fair. This is the third year in a row that Emelie Schepp wins the prestigious Reader’s Choice Award: Crime Author of The Year. The other nominees in the same category was among others: Anna Jansson, Gabriella Ullberg Westin, Jonas Moström, Mari Jungstedt, Sofie Sarenbrant and Stefan Ahnhem. Earlier at the book fair HarperCollins Nordic announced that Emelie Schepp’s new novel in the internationally successful Jana Berzelius-series, titled Broder Jakob, will be published in March 2019. Emelie Schepp is the winner of the Reader’s Choice Award: Crime Author of The Year 2016, 2017 and 2018. She has written four novels in the series about prosecutor Jana Berzelius. Her books have sold over 1 million copies worldwide, been shortlisted for Storytel’s Stora ljudbokspriset and topped the bestseller lists in several countries. In March 2019 the fifth part of the series, Broder Jakob, will be published by HarperCollins Nordic. Emelie Schepp lives in Motala with her family.